I'm an Indian national and I got a job offer in Malta. My future employer has applied for a residence permit on my behalf. 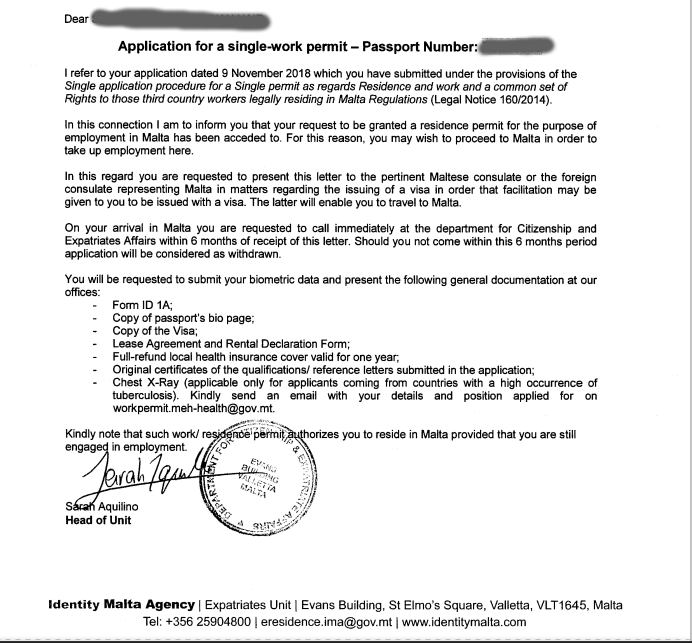 About a month ago, they told me that my residence permit application has been approved and attached a letter from Identity Malta saying that my request for residence permit has been 'acceded to' and that I may proceed to Malta to take up the employment there. In this regard you are requested to present this letter to the pertinent Maltese consulate or the foreign consulate representing Malta in matters regarding the issue of a visa in order that facilitation may be given to you to be issued with a visa. The latter will enable you to travel to Malta. I'm attaching a redacted copy of the acceptance letter. Can someone please let me know if I can travel with just this document or if I need something else. Thanks. We're asking you to take this letter to the Maltese embassy in your country so we can give you a visa that will let you travel to Malta. If there is no Maltese embassy, then we have an agreement with some other country that their embassy will issue the visa for us. The letter isn't enough to travel: you use the letter to get a visa. As mentioned in the letter, you need to go to the Consulate to get the Malta Visa. The consulate is situated in N60, Panchsheel Park North, Panchsheel Park, New Delhi, Delhi 110017, India. The details below. Once you have reached the Malta, you can proceed with the actions mentioned in the last part. Not the answer you're looking for? Browse other questions tagged schengen europe eu permits malta or ask your own question. Is it possible to get a Schengen visa without travel insurance and a copy of the itinerary? Norway to Paris — immigration check? Can I cross EU internal borders without a permit card, but with proof of residence approval? Formal obligation letter or family member?